More than Gays and War. Amid the cheers for equality, some people, particularly high-profile antiwar advocate and mother of fallen soldier Cindy Sheehan, have ranted against the repeal of Don’t Ask, Don’t Tell, not because gays and lesbians shouldn’t fight in wars, but because no one should. In her op-ed piece for Al Jazeera English entitled “Don’t go, don’t kill” (a tad unimaginative, yet apropos), Sheehan pits her belief in gay rights against her undying fight against not only war, but the United States military itself. And, while her commitment to the antiwar movement is admirable, there’s a whole shade of gray missing from Sheehan’s black-and-white argument. The repeal of Don’t Ask, Don’t Tell is more than gays and war. It’s one step closer to a repeal of an American construct that finds itself incongruous with homosexuality. Ronald Reagan’s assistant defense secretary Ronald D. Ray concluded in his 1993 book Gays: In or Out, The U.S. Military and Homosexuals – A Sourcebook that “homosexuality is totally incompatible with military service.” Bluntly, homosexuality is inconsistent with the beliefs of the military, beliefs that help facilitate an American ideal. Gays, lesbians and bisexuals have long served in the military. In fact, this is the reality from which the Don’t Ask, Don’t Tell compromise arose in 1993. Studying the effects of openly homosexual servicemembers in the U.S. military is the next domain. But, even if gays, lesbians and bisexuals don’t flock to their nearest recruiting stations, the end of Don’t Ask, Don’t Tell offers insight into the military’s failing attempt at upholding an aged American ideal. The premise for Don’t Ask, Don’t Tell exists in the realm of nationalism, particularly its appeal to a certain organicness — the idea that above all identities, one is American. Therefore, one’s pronouncement of one’s sexual orientation is ancillary or unnecessary in the military. Yet, the initial intentions of Don’t Ask, Don’t Tell quickly fell by the wayside as witch hunts became commonplace; and, servicemembers living fully under the pretenses of Don’t Ask, Don’t Tell were still in constant fear of being outed and discharged. In the end, Don’t Ask, Don’t Tell was arguably a camouflaged perpetuation of the outright ban on homosexual servicemembers that preceded it. 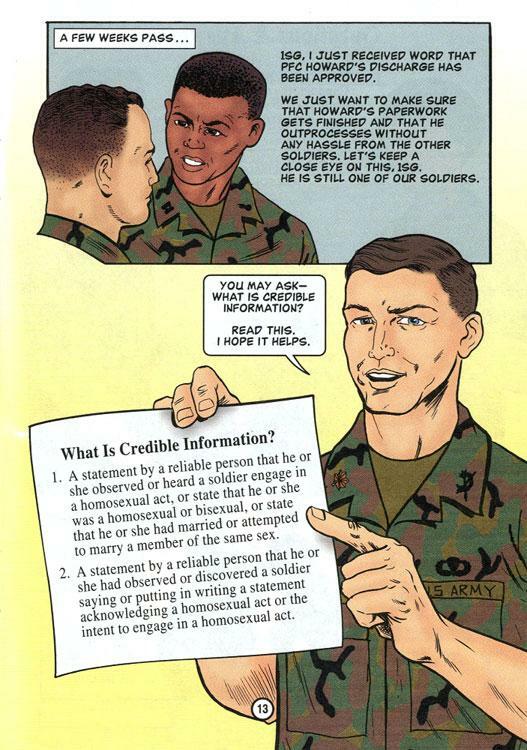 During Don’t Ask, Don’t Tell’s 17-year reign, the military brazenly used pseudoscience, gender norms and an “extraconstitutional” environment to uphold the assertion that being homosexual is not merely incongruous with being a servicemember in the U.S military, but incongruous with being American. In addition, the Supreme Court ironically views the U.S. military as beyond the jurisdiction of the Constitution. This leverage was ultimately used to persecute as a means of buttressing the characteristic religiosity and conservatism of the military’s American ideal. And, while some may argue that militarism lends itself to a certain self-perpetuating conservatism and hypermasculinity, a masculinity ostensibly threatened by homosexuality, the end of Don’t Ask, Don’t Tell may optimistically signal the end of this militaristic ideal being projected as an American ideal. Sheehan gives us an interesting perspective on Don’t Ask, Don’t Tell and war. But, as one of the forefront establishments in dictating Americanness, the U.S. military’s acceptance of gay servicemembers is a step far larger than facilitating the American military machine. The repeal of Don’t Ask, Don’t Tell serves as a sanctioned admission that the identities of gay, lesbian, bisexual and transgendered can, indeed, coincide with and complement one’s American identity. 1. Ray, Ronald D. Gays: In or Out, The U.S. Military and Homosexuals-A Sourcebook. Potomac Books, 1993. Dulles, Va.
2. Sheehan, C (2010, December 23). Don’t go, don’t kill. Al Jazeera English.